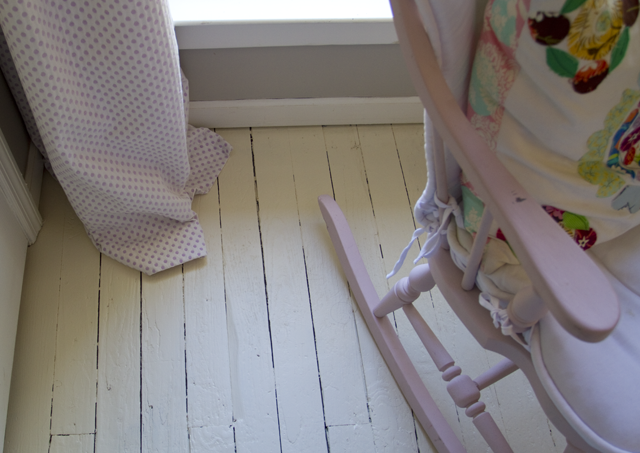 Black and White and Loved All Over: Painted White Floors: Livvy's Room. 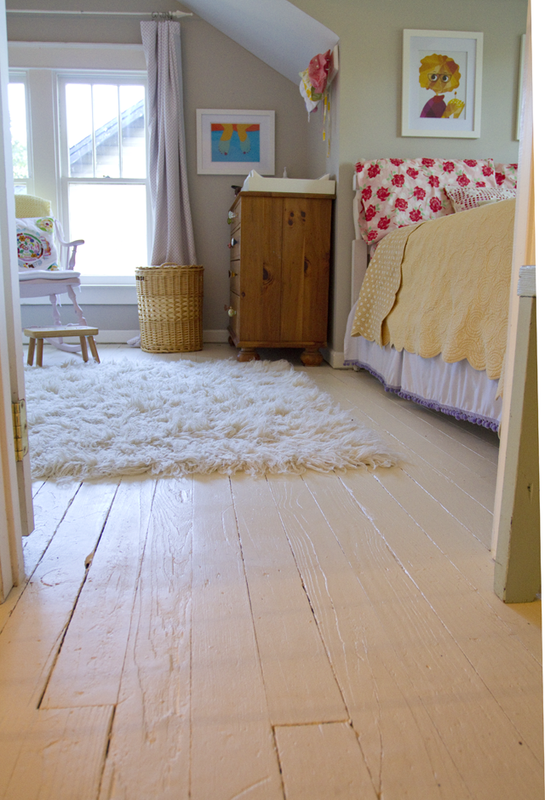 Painted White Floors: Livvy's Room. Painting these floors was the only option. And because they were upstairs, where most of the dirt is contained to Hattie [dog] hair and hairballs from a flokati rug, I decided off white was the way to go. I started a few weeks ago and ripped up the carpet in the small hallway. After some light sanding and some intense vacuuming and staple and nail plucking, I coated the floors with the rest of a can of Sherwin Williams Porch and Floor paint that I had from painting my porch. It turned out so damn fine, and I knew I had to do the rest of the upstairs. The color is "Antique White," which looks almost beige on the card, but is in real life a super versatile, lovely shade of cream. 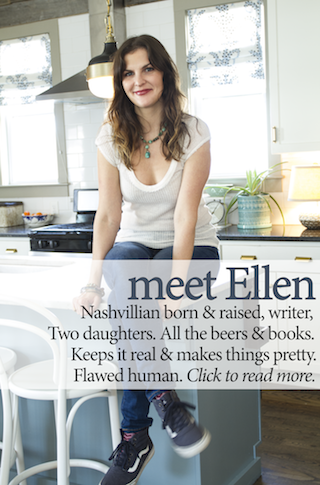 I love that paint could camouflage the hot mess underneath but still show these floors' character. 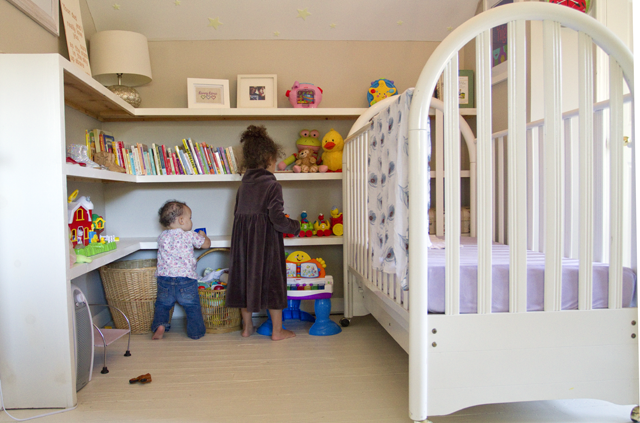 Last week I tackled Livvy's room, also upstairs. Here's what it looked like with carpet. I'm such a nerd because I had so much fun doing it. My friends/family think I'm crazy, but this DIY remodeling thing is just my bag. It makes me happy. It's what I do when no one else is at home (that doesn't happen often); I pour most of my "me" time into my house. My kids are used to me covered in paint, and Tessa will often walk into a room and say tentatively, "Is there wet paint in here?" Anyway, I a-friggin'-dore Livvy's room now. I need to say that it normally doesn't look like this. I moved the diaper pail out of the room, so as to pretend that babies don't poop, because wouldn't that be so awesome? And before I picked up all the books and toys and put them into and onto their respective shelves and baskets, the floor was so thick with toys that I could hardly see it. The floors in our master bedroom will be next. That's the biggest room in our house, so it'll be an undertaking, but worth it. Happy October! We have painted our wood floors too, and we are thinking of doing more rooms. We rented a sander and sanded all the finish completely off. Do you think that's necessary? If it's not it will save a lot of headache in the future! One thing that you must think about Hardwood floor sanding the use of the Ipe wooden floors is that it ought not be used in dry atmospheres. In the event that you do that then the wooden surface may even break. I actually love livvy's room. It looks so neat. I want a room with that color too.